Welcome to Honker Flats. We are the Wallace family, Lew, Tammy and son Marcus. We live in rural Middle River, Thief Lake Township, Marshall County, of northwest Minnesota. That's 58 miles from North Dakota, and 32 miles from Manitoba, Canada. Our farm of 670 acres is called Honker Flats. Honker Flats is so named in honor of the Canada goose. We are located in a main flyway for the migration of Canada geese and other water fowl. Agassiz National Wildlife Refuge is eight miles to our south and we are within viewing distance of Thief Lake Wildlife Management Area also to our south. This area of open flat fields and aspen woodlands is the transition between the Red River Valley to the west and the forest lands of northeastern Minnesota. I sometimes call it a prairie rain forest. We might have had a drought once but I think I went to town that day and missed it. 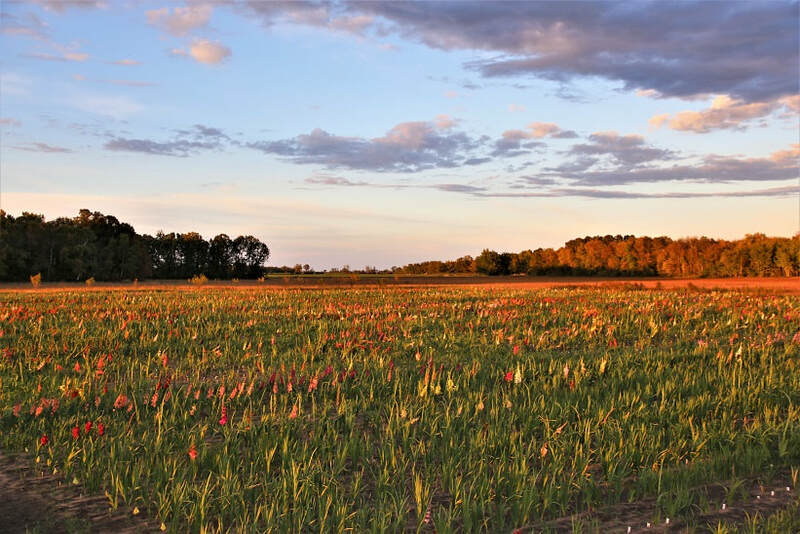 Our glads are planted on a field of light sand, although our soils here vary from light sand and heavy black soils to dark clays. We've always been farmers and gardeners. 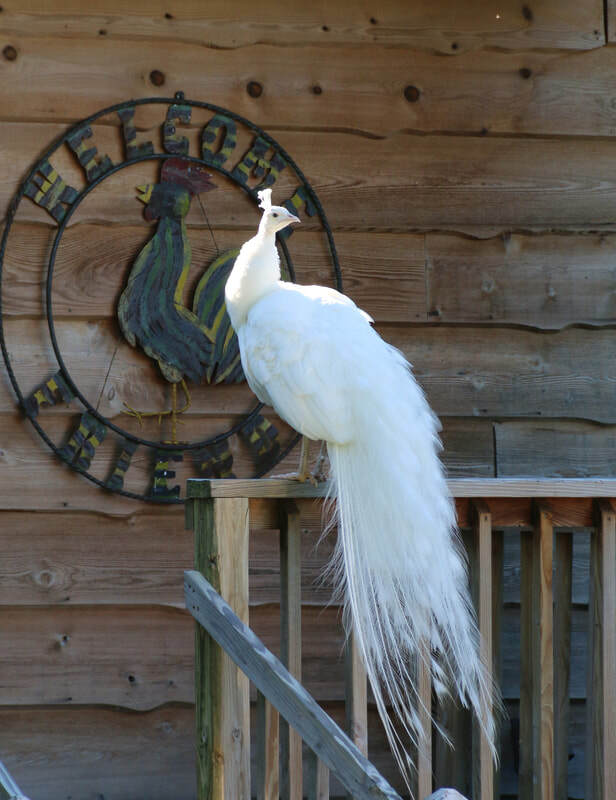 Over the years we've raised small grain, corn and alfalfa for our dairy cows and a farmyard assortment of beasts and fowl. I'm sure I was born with one foot in the garden, and have left few stones unturned in the pursuit of all things green and growing. The greenhouse was started as a 4-H project when I was but a lad. It has flourished and we are in our 43rd season. Originally I started with a couple cold frames made from windows, then an addition onto our family house. We pasteurized all the soil using my mom’s oven. I can’t imagine doing that now, using a semi load of peat based soilless mix. We use LP as a heating source. Our growing area is composed of four 30’ x 150’ gothic style hoop houses in parallel, connected on one end with what we call the breezeway. Our check out area, 30’ x40’, and “30’ x18’ dirt room,” used for flat filling and designing planters, is connected to house #1 and the breezeway. We have outdoor growing space for potted perennials, trees and shrubs, as well as a couple of perennial cold frame hoop houses. Part of the former dairy barn has become our 30’ x 40’ foot Bare Root Room. Here we are able offer bare root fruit trees, shrubs, shade trees, small fruits, etc., in climate controlled shopping. We can hold the plant material from opening weekend May 1st till mid-June. The room is of further use in late summer as the cut glad cooler, then as a cleaning and de-rooting room for harvested glad corms through winter, and winter storage of our fig trees, cacti collection, non-hardy plant materials, a potted peach and nectarine tree. With the glad bulbs moved to the storage and shipping house by mid-February, we move the 4-H sow into a temporary pen in the room to farrow and rear the piglets. At this time the room is also used to house the brooder boxes of our many Exhibition Poultry chicks. Over 90% of our business is retail. We have always enjoyed the interaction we have with our customers, with many relationships continuing generations. Having control of quality from the beginning, to when the plants are place in the car, is awesome. We take pride that the plants only get better and better as the season goes on. You get to shop the whole growing range. First timers are always blown away with the quality of the plants. I believe that our rural setting is a huge plus. How do you get to Honker Flats? By Car. The scenic drive, the wide open spaces, a chance to get away from the hub-bub of shopping in the city, the sights and sounds of the farm all add to the excitement. We seed start almost all of our annual and vegetable pack offerings. It gives us the option to offer a wide and varied selection. Some things we grow by the thousands and others we only need, say, 25 to 50 plants. Besides the regular vegetables like tomatoes and peppers, one of the most sought after plants we offer is ground cherries. We have a dedicated following that come far and wide to get our offering of Lisianthus. We really love the new Roseanne Series, coming in Black Pearl, Brown, Green, and Deep Brown. They make excellent cut flowers as well as garden plants. Forty years ago our product mix was 80% vegetables and 20% flowers, almost all in multi-cell packs, with geraniums as the #1 four-inch pot item. 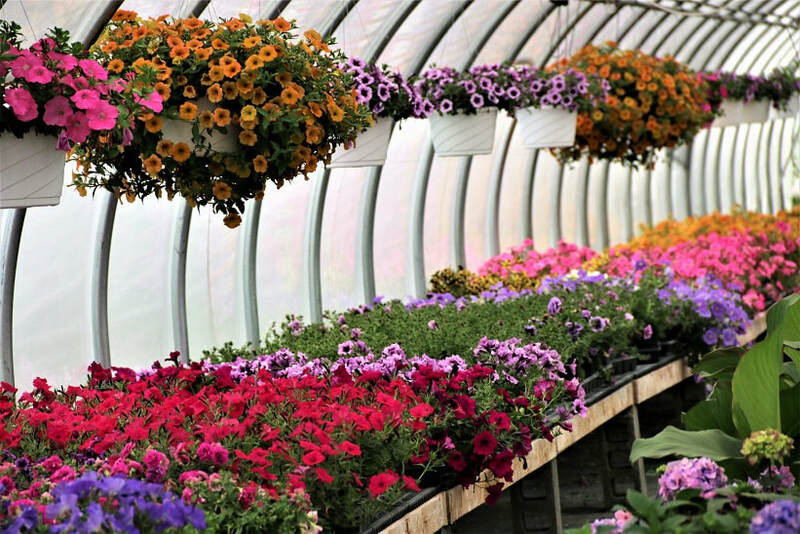 Now, flowers are easily 75%; and of that, over half of that is in 4½ inch pots. Great strides in vegetative propagated plant selections, with unique and useful traits, have led to this erosion of use of seed grown, pack annuals. Geraniums have their following, but other species like petunias and dahlias have gained favor with today’s gardener. With patented vegetative plants becoming a major portion of our offering, most of which finish on the bench very quickly, in recent years we are comfortable starting to heat the greenhouse the first week of March. It’s challenging to get the timing right so the customer has a vigorous growing plant to take home. We don’t use growth regulators on the plants to slow them down or hold them. Some pinching and pruning, when needed, seems to produce the best plant in the long run. Although dairy farming had played a large part in our lives, the dairy cows were sold in 2005, allowing us to do even a more spectacular job with the greenhouse and nursery business. This move also allowed us to pursue our interests in gladiolus, hence the gladiolus catalog. Our first major association with gladiolus came with a visit to the Winnipeg Gladiolus and Dahlia show in 1994. It was love at first sight and we met a wonderful group of people dedicated to the gorgeous gladiolus. 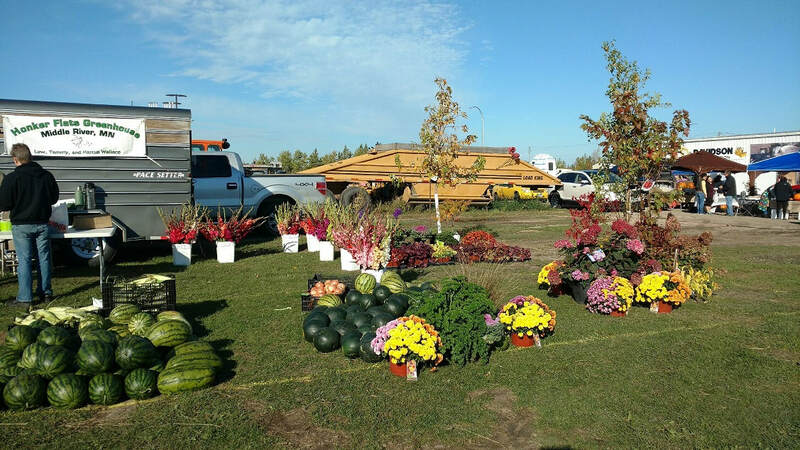 We joined the Winnipeg Gladiolus and Dahlia Society and exhibited at the Society Show in 1995. A couple of Minnesota Gladiolus Society members were at the show and we soon received a gift issue of the MN Glad Fan. In 1996 we joined the Minnesota Gladiolus Society, and showed at the New Ulm Show that summer. We also joined the North American Gladiolus Council that year. We have had the time of our lives! We'd like to acknowledge the 50 years of learning we've received from 4-H, first as members and then as volunteers. You cannot underestimate the value of the basic fundamentals, whether in life or gardening. 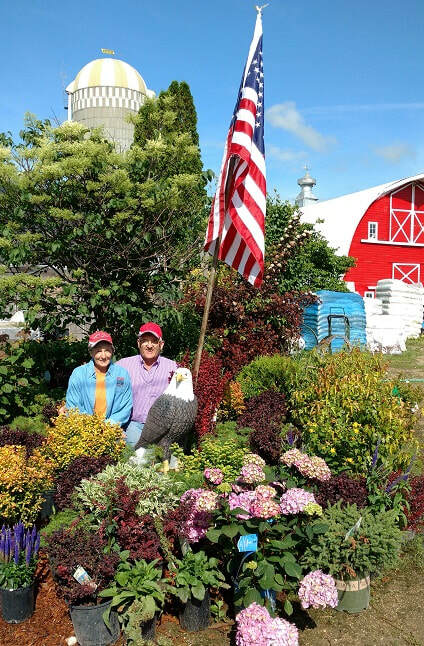 We would also like to thank the members of the Gro Rite Garden Club of Badger, MN for the 40 years of cultivating our enthusiasm for gardening and flower arranging. We can always depend on them for the highest degree of sharing and competition. 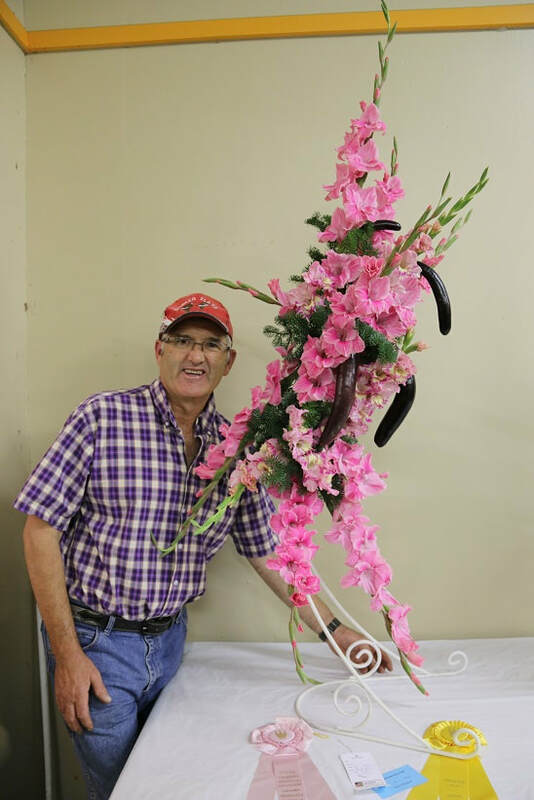 For many years we exhibited at the Winnipeg Gladiolus and Dahlia Show, and the two Minnesota Gladiolus Society Shows. After 2005, the Winnipeg Society dissolved, leaving a big hole in our show circuit. 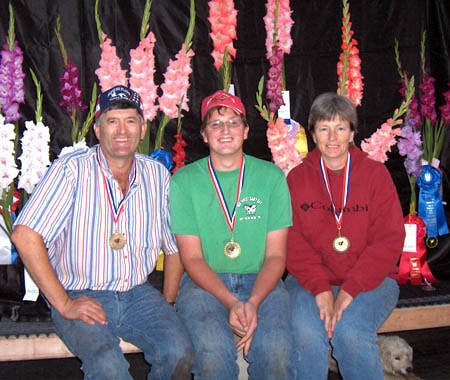 In 2006, we trialed a Gladiolus Festival at Honker Flats. 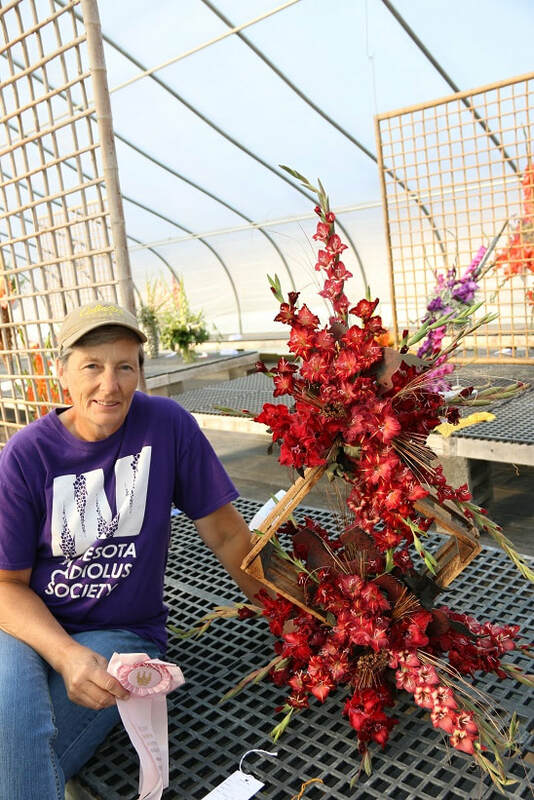 In 2007, the Minnesota Gladiolus Society came on board, and now holds three shows each year. The first show is held at the Brown County Fair, New Ulm, Minnesota, in the 2nd weekend of August. The second show is the first weekend of the Minnesota State Fair at the Horticulture Building. Then it's the show at our farm. On Labor Day weekend each year, one of our four greenhouses is set up to host the Minnesota State Gladiolus Society Spike and Seedling Show. We call it the Honker Flats Gladiolus Festival. Minnesota Gladiolus Society is the largest in North America. Spike entries at shows are consistently over 400, with 100 to 150 designs. ​We have enjoyed all aspects of glads, but are most passionate about designing with cut glads and other plant materials. Glads are so easy to work with, and especially suited to creative designs, as they don’t wilt quickly, we use them in many aerial designs. The challenge especially comes with the interpretive design classes. Many exhibitors think too literally about the categories. I like to feature the squeal rather than the whole hog. The number one goal: create a design that satisfies yourself first, others can appreciate it if they like. Designing is a perishable art form, each one your own Picasso. Collecting props and thinking up creative ways to present glads is fun. Many shows become a marathon of endurance, we often stay up through the night to get the exhibits in place for the next day’s judging. The fellowship with other exhibitors over the years has been awesome. We always encourage new exhibitors, and thus the competition expertise level increases each year. Tammy and Lew are consistent winners of top prizes in competitions they enter. We have used designing at shows as a family activity since we were married. Our son, Marcus, has been designing since he was 4. He is now 25, and is capable of winning “on any given Sunday,” as they say. 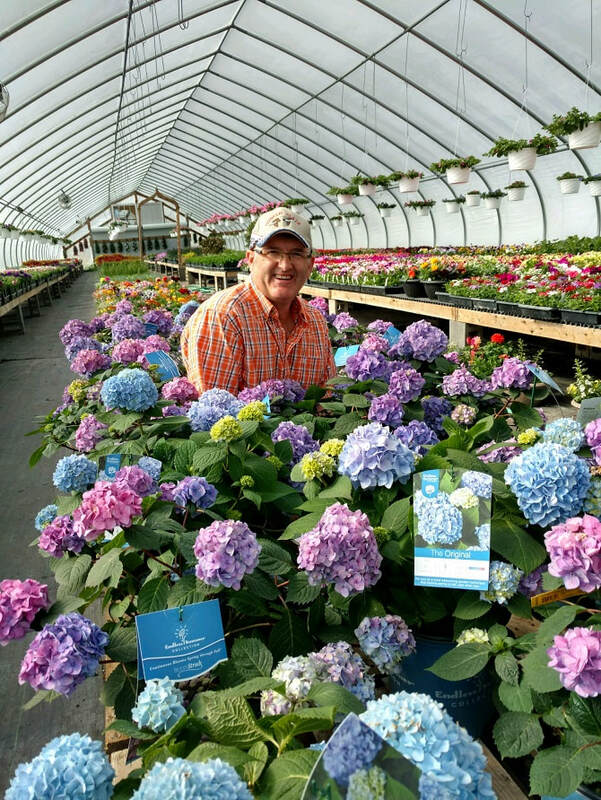 Our acreage has blossomed to several acres with hundreds of varieties. In 2006, we published our first catalog, “Gladiolus Exoticus”, featuring novelty and decorative glads that lend themselves to arranging. Our catalog features the ones we have enough of to sell. Others that we have in smaller quantities will be offered in the future. Our focus has always been health and beauty. 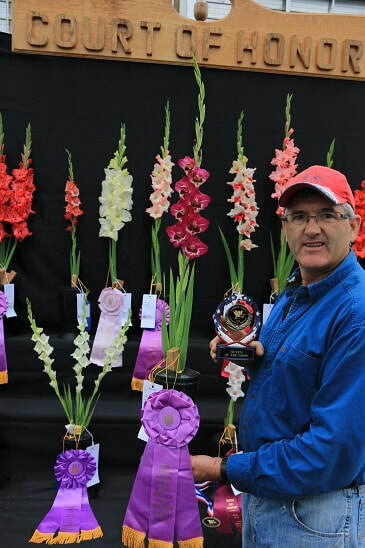 Only a few varieties ever gain "Queen of the Show" status, but many lovely ruffled waxy glads including loud wild colored novelties, scream to be grown, cut and shared with the general public. Several hybridizers introduce their seedlings through our catalog. Don Selinger of Woodbury, MN and the late Bob Longhenry of Fargo, ND were very supportive with wonderful new creations for our first catalogs. Currently, Don Selinger; John Meyer of Rochester, MN; Dave Kollasch and Robert Schalow of WI; and Cliff Hartline of Ohio, will offer introductions this year. I have done some hybridizing, and have introduced a variety, “Crane Song”. A few more are in the pipeline, but since the catalog was launched, lots of time has been enjoyed evaluating and growing seedlings of other hybridizers. It has been awesome seeing the cutting edge from these growers. We also purchase glad bulbs from other growers in North America, and many varieties from Czech Republic, Latvia, Lithuania, and Russia are highly sought after. Glads and flowers provide fun opportunities to share with our community. We donate corsages, arm bouquets, and stage flowers to two Scholarship Pageants, Miss Middle River and Miss North Star Pageant affiliated with the Miss Minnesota Scholarship Program. We are the Poultry Superintendents at the Roseau County Fair and go all out decorating the building. We have a fun area set aside in the middle of greenhouse #1 for hosting groups. Lew is a colorful demonstrator at the Minnesota State Fair, donning a multicolored Mohawk wig for his amusing gladiolus design presentations. Tammy and I were just awarded the GOLD MEDAL for our contributions for the advancement and promotion of Gladiolus, to the "Gladiolus World" by the North American Gladiolus Council (NAGC), awarded at the annual convention held this year in North Myrtle Beach, SC. 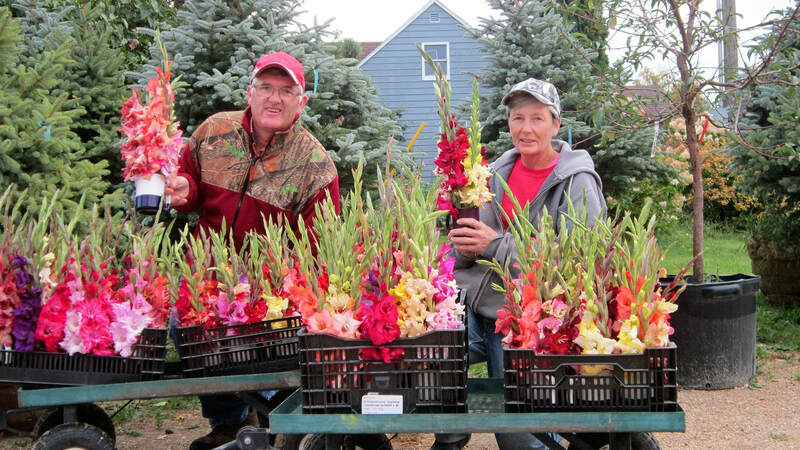 ​Tammy and I are members of The Minnesota State Gladiolus Society, of which Lew has been a director for many years. We are members of the NAGC, where we serve as co-chairmen of the Publicity and Promotion Committee. Lew also serves on the Judging Standards Committee and Classification Committee. Tammy and I are both Horticulture and Design Judges for 25 years, through Minnesota Horticultural Society. Lew is a NAGC Accredited Spike Judge. Lew is currently serving as Vice President of the NAGC. Cup-o-Glads, our gift for staff and students at Greenbush/Middle River School District! Go Gators! Looking forward to spring, on the greenhouse benches. Sunset on the glad field at Honker Flats. Tammy with her design, "Texas Roadhouse" Honker Flats Glad Fest. Wish you were here! Make sure you see it this year! How big will his tail be this year!